A group of Beaver Scouts took an usual slant on the traditional Bob a Job tasks. 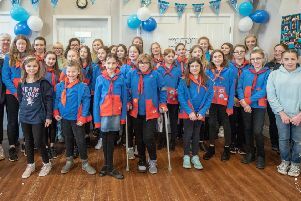 The 14th Harrogate Woodlands outfit did jobs in exchange for items that would be donated to Harrogate Homeless Project such as food, toiletries and cleaning products, as part of months of hard work towards their Community Impact Badges. Pam Mullen from Harrogate Homeless Project was invited to visit the children by Sue Sibley, one of the group leaders, to express thanks on behalf of all the Service Users for the childrens’ hard work. The youngsters were given a brief talk on the work of the Project and about homelessness and came up with some fantastic and insightful questions for the Q&A session. The visit finished with the children receiving personal appreciation certificates from the Project.